The three-time Hugo Award-winning author continues her second trilogy in the "superior alien-contact series." (Kirkus Reviews) National best-selling author and winner of three Hugo Awards, C.J. 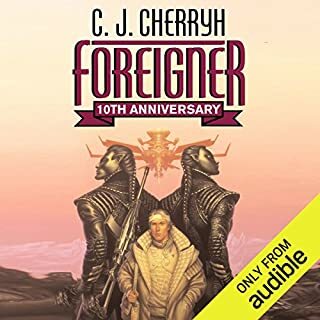 Cherryh presents book two of her second Foreigner trilogy - the epic story of a single human delegate on a hostile alien planet. 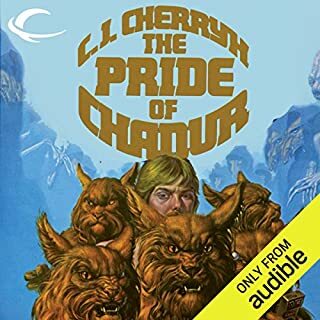 In this long-awaited sequel to Precursor, the alien atevi enter the treacherous politics of space travel-as their one human negotiator is caught in the throes of a mutiny. ©2001 C.J. 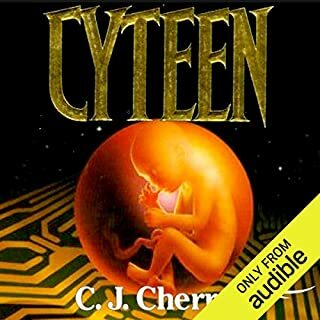 Cherryh (P)2012 Audible, Inc.
STORY (sci-fi) - Wow, this series has hit its full stride! It's long (15 books), and Defender is Book 5. The first three books were good, but there was lots of background to assimilate, character development, even some special language to learn. But it's time well spent, because the last two books -- wow! I'm definitely in for all 15! If you look at the cover art, you will get an idea of the story. Bren Cameron is a human negotiator/translator who lives with a larger, black-skinned alien race "atevi" on their home planet. There is a human colony on the planet as well. As you might imagine, there are all kinds of differences and difficulties with their cohabitation, just like we have here on earth. 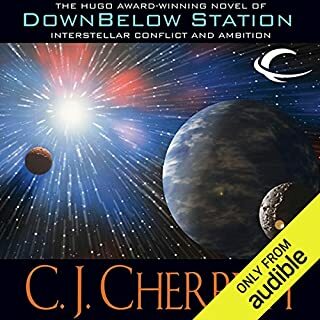 Things are further complicated by the fact that the humans have detected another possibly evil alien race on a remote space station and fear it may have plans to attack them. The human/atevi alliance is strained to come to agreements regarding their own space station, ship construction, space travel and how to potentially deal with the aliens should there be contact. Bren is in the middle of a myriad of difficult decisions and must navigate all kinds of deception, ulterior motives, etc. It's absolutely fascinating, but if you're looking for lots of neat gadgets, weird creatures and action scenes, this is not the book for you. This is more about thinking and problem-solving, because that is what Bren's job is all about. PERFORMANCE - Great job, great character differentiation. Can't imagine anyone doing it any better. OVERALL - You must listen to this series in order, as each book picks up where the previous one stops. That said, each book ends at a good stopping point should you decide to "exit" the series at any time. I don't recall any violence and only heard "damn" a handful of times. There's one extremely minor sexual reference in the story. Very highly recommended for anyone who enjoys sci-fi and dissecting difficult situations. What made the experience of listening to Defender the most enjoyable? The story keeps building up. Ilisidi dowager aji and Bren make a good team. They understand each other and work along very well. Bren's team of security guards/body guards headed by Banichi is really good. .
All. Daniel Thomas May's performance for all the different characters makes one relate to the story wonderfully. When Bren lead his team to stop the mutiny. 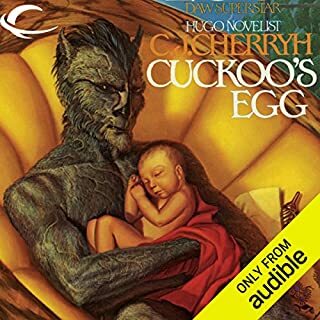 I enjoy this series so much that I have started collecting the audiobooks for my own library. 3 More Years have passed!! )-: !!!! The wheel of time never stops to turn, just like the lies, machinations, subterfuge and betrayal. And in the middle of all of these is Bren Cameron,paidhi-aiji translator to the court of Tabini, Lord of High Heavens. Would you listen to Defender again? Why? Absolutely! Even knowing the plot and the characters involved, HEARING the tale told again after a bit of time is still incredibly entertaining...like a favorite holiday movie. 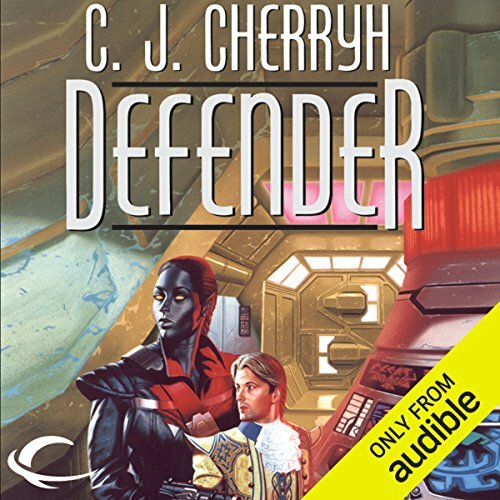 What other book might you compare Defender to and why? Kim Harrison's "The Holows" series seems at first an odd comparison but not if you consider the wonderful twists and turns in plot due to that reality's rules...same with the Atevi series...always surprises because of newly revealed species and social rules. No, this is my first experience with Daniel Thomas May's readings but he definitely has the right tone and timbre of voice for this series of stories. He's able to capture the various characters' personalities very nicely with voice variations and he stays on pitch for each one. I think the whole notion of a human in the midst of such a different society moves me. That and how Bren Cameron tries to balance being with Atevi and of humans...a tough dance, is very poignant. Yes, read the series, start at the beginning and enjoy the journey. If you like Star Trek or Star Gate you'll likely enjoy this set of books. While the earlier books in this series provide stories that are a mix of politics, interpersonal relations, fighting and sci fi, this story is almost pure political intrigue. Coming into this story I thought I had a pretty good understanding of the various characters and what they were about. This book provides a good reminder that a reader should never get too comfortable. Bren is suddenly cut out of the loop by Tabini. The mutiny against Captain Ramirez may or may not have been what we thought it was. By the time this story had concluded I found myself wondering about Tabini, Jason, Sabin, and Captain Ramirez just to name a few. 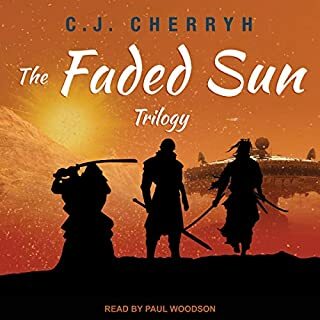 I have not listened to the next book in the series yet, but this one certainly seems to set things up nicely for C. J. Cherryh to blow things up again so she can put back the pieces in a new and clever way. You may as well buy the next book along with this one. There is no way to finish this one and not be compelled to found out what happens next! Absolutely loved it & cannot wait until I make my way through the next several books...ULTIMATELY absorbing, interesting, and wonderful! Daniel Thomas May has a way of making each voice unique so that listening alone picks up the character speaking, like the voices of friends--I don't know how he does it, but love, Love, LOVE the results! Series moves at snail's pace. Political intrigue, if you like that. Will finish series nonetheless. This is the 2nd book and like before with these sets of books the review I have is on the first book in each "Sequence" so go there for the full review. Not much happened in this book. It was good but Brin ruminated so much about his family obligation that I wanted someone to hire the Assassin's Guild to take out his mother just to quit hearing about her. I can't believe the Atevi monarch didn't know what was going on there. Oh well, he finally moves on and things start happening so that I have already downloaded the next book.